It’s that time of year where we’re sharpening our pencils, shopping for new duds, and if your little guys or gals wear glasses, get their eyes checked and ready to see the chalkboard clearly! As our kiddos head back to school, it’s imperative we take care of their vision and make sure they are prepared with the proper prescription lenses. One thing many parents put off and shouldn’t is an eye exam! As we approach back to school, it’s important to remember that as much as 80 percent of a child’s learning stems from sight. Undiagnosed or untreated vision problems in children can lead to headaches, avoidance of schoolwork, acting out in class and perceived inability to comprehend assignments. Children are also increasingly spending more time in front of digital devices, even taking exams on tablets, which can also lead to digital eye strain. We love Transitions lenses because they ensure that young eyes are protected indoors and outdoors. All Transitions lenses block 100% of UVA and UVB rays, and they reduce exposure to Harmful Blue Light both in the classroom and on the playground. Also, it’s fun to let kids pick out a frame that match their personality and make them feel confident. The days of being called 4-eyes are becoming a thing of the past. Glasses are cooler than ever – they’re no longer just a necessity but a stylish statement so we wanted to share some tips and looks to help inspire your little student to pick the best spectacles for her or him! Since this post is part of our collaboration with Transitions Lenses, our first tip is that their lenses aren’t just for us grown-ups (we are loving ours) but a great option for kids too. Whether they are riding on the bus, doing times tables at their desk or playing outside during recess, their eyes will comfortably adapt to changing light. As parents, we love Transitions for our kids because the lenses keep them protected from UV rays and Harmful Blue Light from digital devices and the sun. Kids love Transitions lenses, too, because of their magic ability to tint to the color they choose.. Ask your optometrist about them, or go to Transitions.com to find an eyecare provider near you. Tip 2: Consider Color! There are so many fun frames out there in a variety of vibrant shades. We adore these bright pink Cat Eyes with a fun pop of red temples so much we wish they made ’em in our size! These are for the girl that has an eye for color and isn’t too shy to express herself boldly! She’s filled with imagination, creativity and a love for learning! And she can further customize her look with Transitions lenses by picking out her favorite lens color as well. Tip 3: If your son or daughter is the athletic kind, be sure to find a flexible yet sturdy frame built for the active kid. 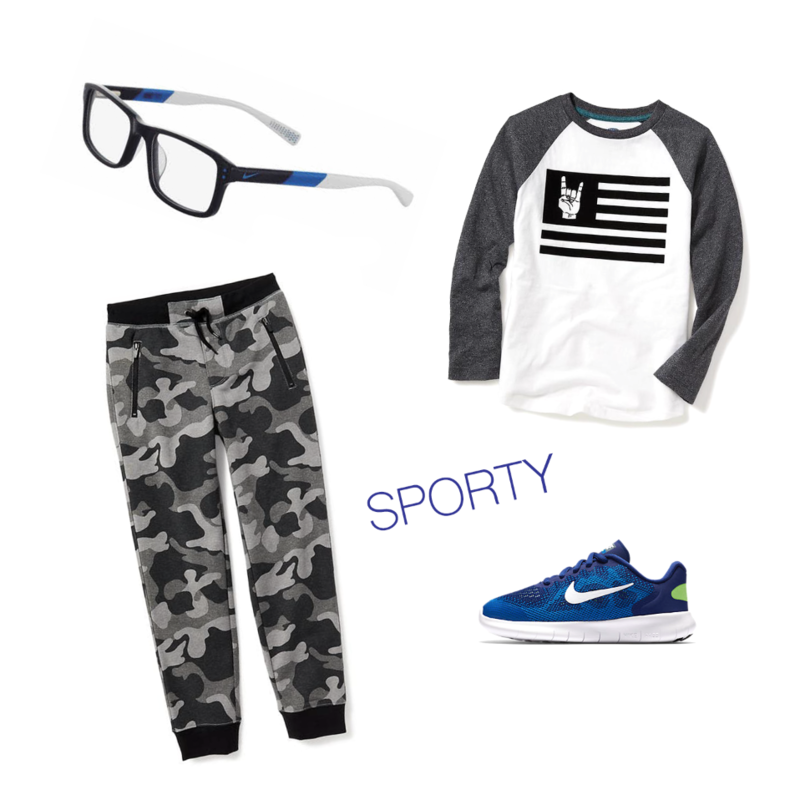 There are lots of sporty frames out there that can bend, and even some that have an elastic strap around the back to stay put while your little baller is running down the court and going for the shot! And the best news? Whether your active one is playing sports in the gym or inside the classroom, Transitions adapt to offer maximum protection from harsh light. Tip 4: If your kid isn’t one for color, going with something neutral and classic is always a safe bet; however, there’s a new neutral on the block and it’s clear! This classic frame shape gets a modern update with a see-through hue! They will always be in style, matches with everything and looks great on just about everyone! Tip 5: (I think that’s how the Phil Collins song goes right?) However it goes, there is nothing that looks smarter than the always cool “nerd” Ray Ban glasses in a clean, bold, black with the tiny silver accents. These glasses say, I’m serious about my studies AND my style! And don’t forget, if your child is using a digital device to finish their studies or pass the time, Transitions lenses will also help protect their eyes from the Harmful Blue Light emitted from their screens. Don’t be afraid to be NERDY while keeping those eyes safe! Tip 6: Where color meets clear! Here we have two trends coming together in a way that rocks! If you’ve got a budding musician on your hands, chances are she likes to look the part, so she might want to find something that is unique! 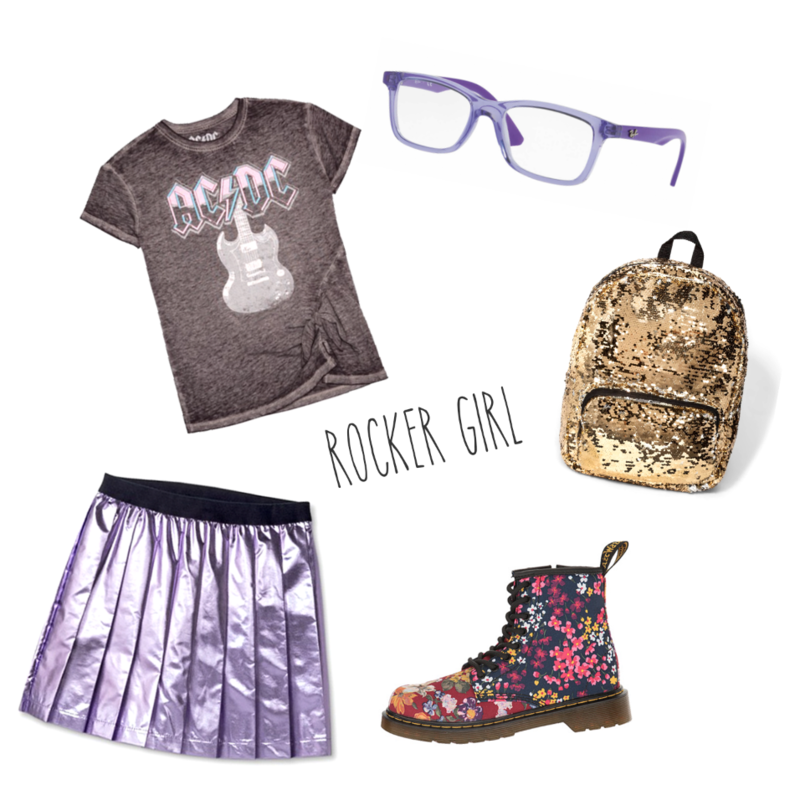 Whether she’s shredding on the guitar, the violin or the tuba, she is gonna need some wicked awesome glasses like these soft purple specs to read the notes! 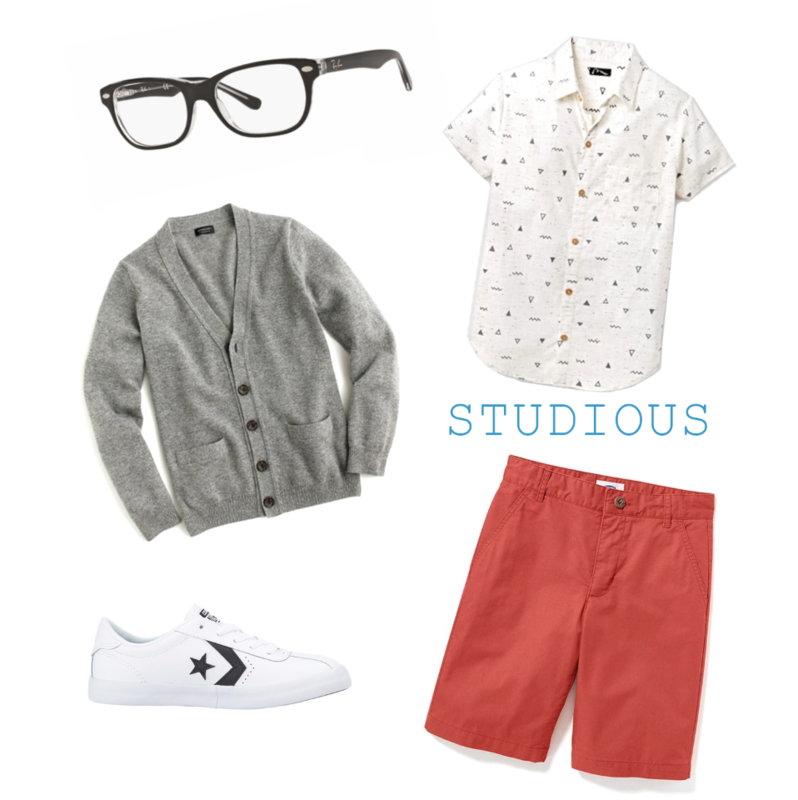 TIP 7: For the 6th grader channeling his inner James Dean. Tortoise shell will forever be COOL! Again, you cannot lose with this shape or color! 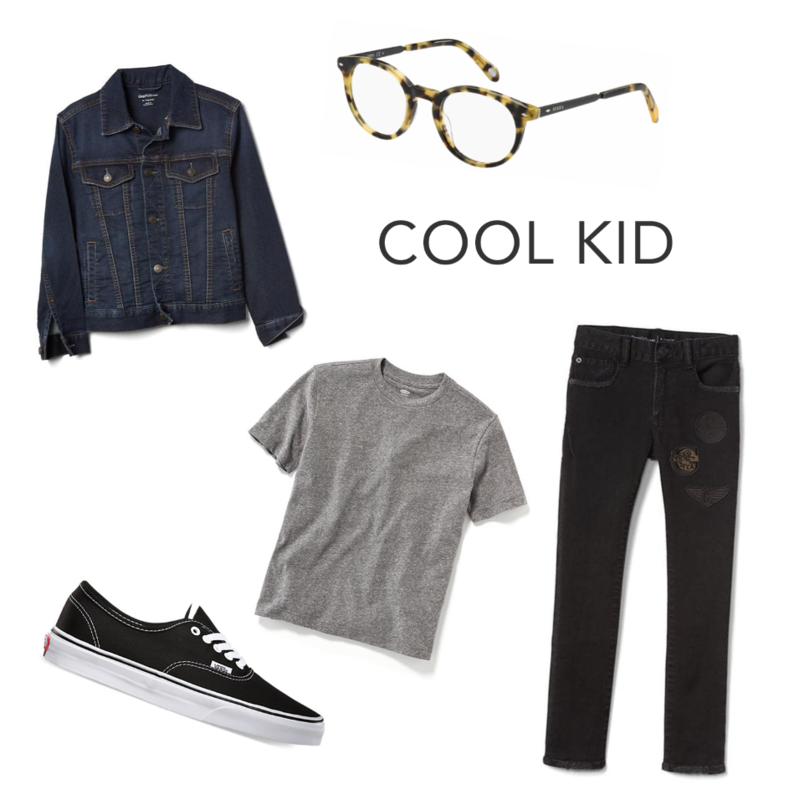 So if you’ve got a lad that likes to wear a jean jacket and keep it effortless and easy, this is it!